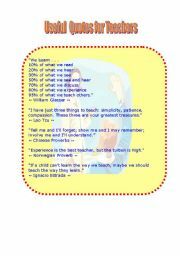 I am an ESL teacher in Vietnam. 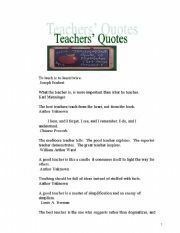 Teaching is both challenging and motivating. I would like to thank all of you for so many wonderful things you share on this website. I hope my worksheets bring you something useful and interesting. These quotes have been collected for ages. I would like to share them with you. Why don´t you try my ICEBREAKERS (part I and II)? These quotes have been collected for ages. I would like to share them with you. 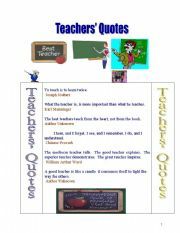 If you like this, you may want to have a look at my other eslprintables. Thank you very much for your comments. Pair work / Group work. 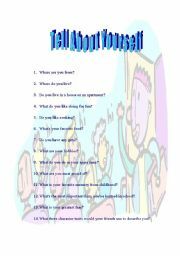 This worksheet is used to challenge ESL students. This can add some fun to your class. My students enjoy doing this very much. I hope you enjoy it. 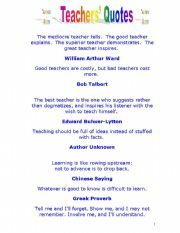 These proverbs helps us have a look at our teaching career. It´s a great way to remind us of our methodology, too. Hope they are meaningful and useful. 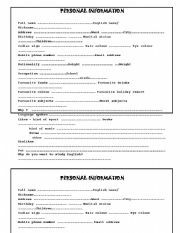 This form is used for first day of class or practising speaking. Thank you very much for your comments. 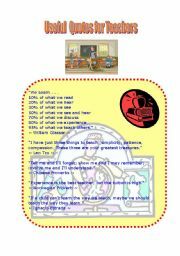 This is a pre-made conversation for your students to practice conversation in class. I hope your students will enjoy doing this. The Comparative and Superlative Forms of Adverbs. I hope you find something useful for your students! Thank you for all the kind comments relating to ICEBREAKERS (part II). Enjoy ICEBREAKERS (part III). ICE BREAKERS FOR FUN. I hope this work well and your students have fun. 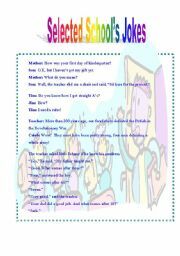 A very good way to help your students have fun with the English Alphabet. Have Fun with Plan B! This is a very exciting activity to challenge my students in conversation class. 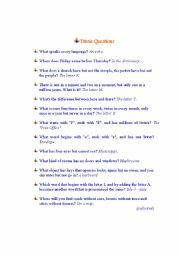 This can be used to test students´ general knowledge. My students enjoy doing this very much. This can be done in pairs or groups. I hope you enjoy it.